October is National Breast Cancer Awareness Month and Rockers Against Cancer is holding two charity events to benefit Miracles for Kids, a group that helps families of children with terminal diseases such as cancer. The feature event this year is the 4th Annual Rockers Against Cancer Benefit Concert at the world famous Whiskey a Go Go in Hollywood on October 22nd. The Concert features several excellent heavy metal bands, headlined by LA Guns, featuring Tracii Guns and Rudy Sarzo. Tracii is an original member of Guns ‘n’ Roses, while Rudy Sarzo’s resume includes playing with Ozzy Osbourne, Quiet Riot and Whitesnake. Also sharing the bill is famed Los Angeles area band DC4, featuring Jeff Duncan of Armored Saint and Rowan Robertson, guitarist for the late, great Ronnie James Dio. Ronnie James Dio, along with other great musicians such as Bob Marley, Frank Zappa and Mick Ronson, was a victim of cancer. Opening the show is Bloodlust and Burn Cycle, two very popular LA-based bands. Rounding out the show are Psychic Mafia and Attack of the Rising. Tickets are $15, with doors opening at 6pm. There will be a raffle and charity auction, featuring an autographed guitar from Yamaha, music equipment from JBL and a special dinner from Del Frisco’s Grille. Rockers Against Cancer is also holding a Bike Run and Benefit Show at Cook’s Corner in Orange County. Open to everyone and a family-friendly event, any interested bikers can start from one of several locations including Lifestyle Cycles to ride to the event. There will be BBQ food at Cooks Corner, with $3 of every meal donated to Miracles Against Kids. Playing at the event will be three classic rock tribute bands. Headlining will be Southbound, a tribute to Lynrd Skynrd. Also playing will be Los Pendejos and ZZ Top’r. In addition, there will be a bikini contest. 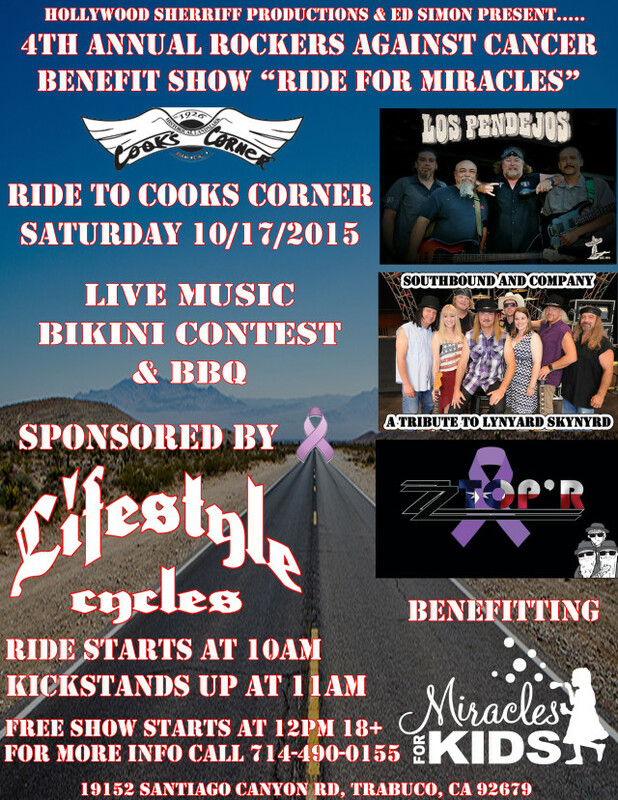 The Bike Run and Benefit Show, a free event, will be held on Saturday, October 17th. 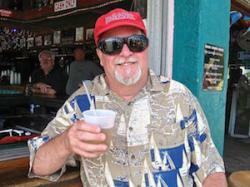 Johnny Reb’s True South is supplying a special dinner for 8 for the charity raffle. One area that people often forget about when they think of cancer patients are the families. The disease takes its toll on the young cancer victim’s family, who suffer while watching their young loved one slowly deteriorate before their eyes. Meanwhile, many families over-extend themselves, spending money on chemotherapy and other treatments, second opinions and various clinics to attempt to stem the tide of the onrushing disease. Insurance often only covers a fraction of what it costs to fight cancer’s terrible onslaught so the child’s parents often sacrifice clothes, rent or mortgages, even food to the rest of their children in order to attempt to save the life of the young cancer victim. 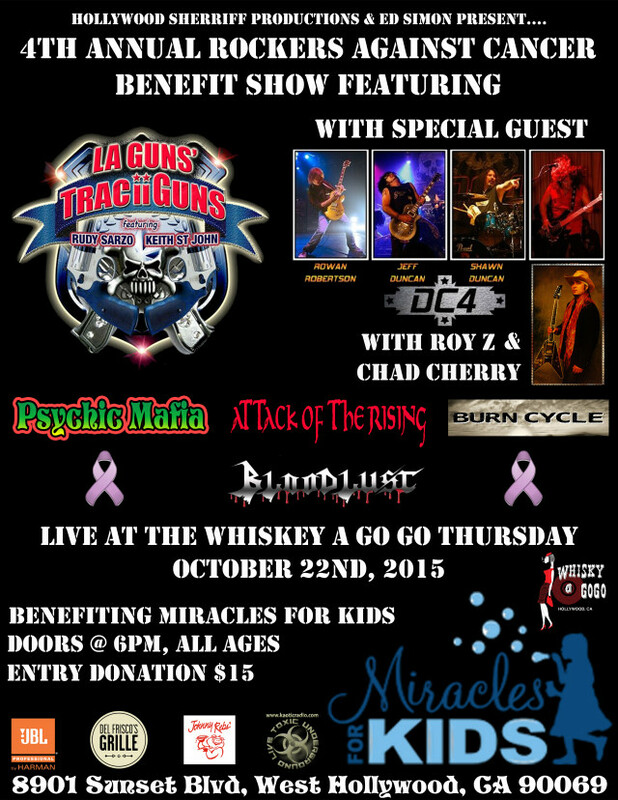 For 2015, Rockers Against Cancer has chosen Miracles for Kids as the beneficiary of the funds from these events. Miracles for Kids are a 501(c)(3) nonprofit serving children with life-threatening illnesses and the families that care for them. By operating programs that provide financial aid, basic needs and wellness to patients and their families, Miracles for Kids creates stability when families are crumbling from the financial and emotional devastation of fighting for their child’s life. These events are both a good way to hear some great music and have fun as well as participate in a charity event to help families suffering from their child’s terminal illness. So especially in October, National Breast Cancer Awareness Month, please come on out, have fun and support Rockers Against Cancer and Miracles for Kids. If you can’t make it to the events, donations can be made here. This entry was posted in Events, Miscellanious, Upcoming Events and tagged Cook's Corner, Ed Simon, Miracles for Kids, Rockers Against Cancer, Rudy Sarzo, Tracii Guns, Whiskey a Go Go. Bookmark the permalink. There has been a change to the band list for the Whiskey a Go Go show. Due to circumstances beyond their control, DC4 is out of the show. Instead, Roy Z and Chad Cherry will be joined onstage by LEON HENDRIX, the brother of Jimi Hendrix. This should really crank up the show!